Umbria has been a countryside territory since forever and its cooking reflects this with uncomplicated, appetizing plates prepared from wholesome ingredients. Local agriculture makes crisp fruit and vegetables, high quality olive oil, pig food and juicy t-bones, while the rivers provide trout, perch, carp, tench, mullet and pike, in addition to the woods mushrooms of honor quality. Lentils, cheese and black truffles arrive from the Valnerina and white truffles from the High Tevere basin. The knolls are carpeted by vineyards that give a fragrant wine to go together the wholesome and appetizing food. The major food preparation tools are spits and griddles, whilst aromatic herbs offer an unambiguous aroma to the cuisine, and olive oil is an elite dressing. All over the province incomparable pig appetizers can be tasted. The hog recipes are paired with Torta al Testo based on the standard Perugian technique, sandwiched with ham or sausage or along with the sweet hint of sage and onion; spleen or pounded truffles croutons with anchovies fillets; pancakes called Arvoltolo are eaten hot and sprinkled with salt or sugar. Together with the appetizers, but principally along with an aperitif, black olives savored with orange peel are served. 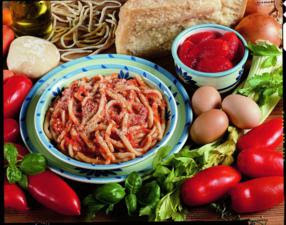 In the array of first entries there are at least three regional specialities: the Ciriole, home-made egg noodles along with browned onions, garlic and oil. Strascinati are small pasta including sautéed sausage plus eggs mixed together with Parmesan cheese. Whilst Umbrici are hand made spaghetti. Spaghetti or Risotto could be prepared including grated truffles. These are just the most traditional dishes. Tomorrow I will list the most popular second courses!